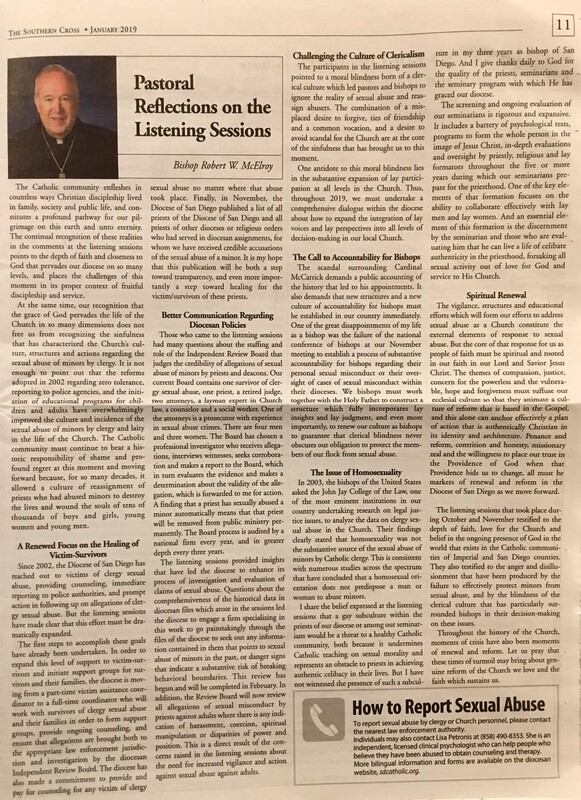 Bishop McElroy’s statement took up nearly all of page 11 of the January edition of The Southern Cross. Major concerns at the listening sessions involved care and healing for clergy abuse victims, actions taken against predators, bishop accountability and perceived connections between homosexuality and clergy abuse (since most of the victims are male). Some of the 2,000 parishioners attending — including conservative Catholics associated with far-right publications that oppose Pope Francis’ policies — insisted that homosexuality was the root of the clergy abuse. That segment said that gay people shouldn’t be allowed in the priesthood and that gay influences exist in seminaries. Throughout his tenure, McElroy has welcomed the LGBT community to Catholic churches and said gay men could be ordained if they, like all priests, pledge to be celibate. Another major concern at the listening sessions was bishop accountability. Some have been accused for years of ignoring victim accusations and transferring offending priests from parish to parish. The Vatican had asked U.S. bishops to delay their vote on proposals at that time. The pope plans to meet with bishops worldwide in February about the clergy abuse issue. 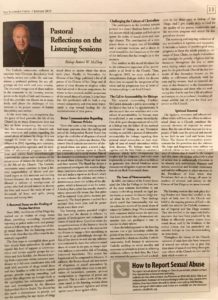 “We bishops must work together with the Holy Father to construct a structure which fully incorporates lay insights and lay judgment,” McElroy writes in the 38,000-circulation Catholic newspaper for San Diego and Imperial counties. McElroy himself was a target of criticism when he didn’t act on warnings about sexual abuse against New Jersey seminarians and an altar boy by ex-Cardinal Theodore McCarrick. Former priest Richard Sipe, the late clerical sexual abuse expert, wrote to McElroy in 2016. The bishop asked Sipe for corroboration of the accusations, but it wasn’t provided, McElroy told parishioners in at least one listening session. The bishop also discusses clericalism – the privileged status of priests — as a source of the clergy abuse scandal. “The combination of a misplaced desire to forgive, ties of friendship and a common vocation, and a desire to avoid scandal for the Church are at the core of the sinfulness that has brought us to this moment,” he writes. An antidote to the “moral blindness,” he said, was the “substantive inclusion” of lay people in all levels of the decision making of the local church. 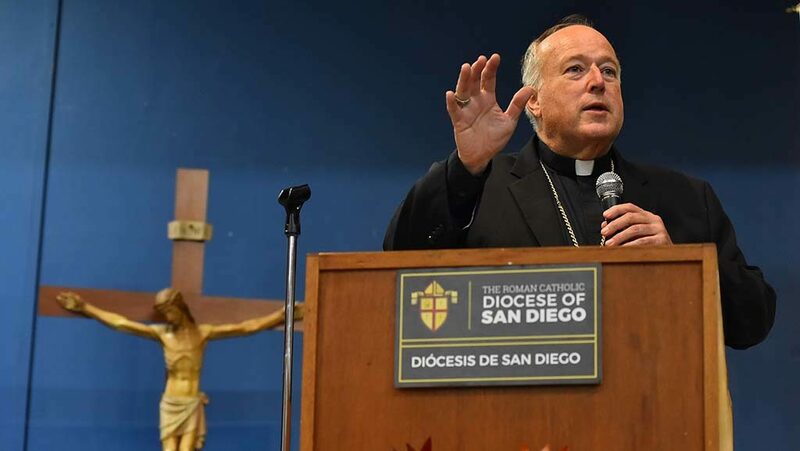 The San Diego-Imperial diocese counts about 1 million members. While noting calls for an end to celibacy for priests and the inclusion of female priests, McElroy didn’t advocate in the statement for either of those proposals. Regarding help for victims, the diocese will convert the part-time position of victim assistance coordinator to full-time, McElroy announced. That employee will work with survivors of clergy sexual abuse and their families, form support groups, provide ongoing counseling, and ensure that allegations are referred to law enforcement and the diocese’s Independent Review Board. The diocese also will provide and pay for counseling for any victim of clergy sexual abuse regardless of where the abuse took place. Parishioners at the listening sessions also peppered McElroy with questions about church procedures for dealing with abuse accusations. The bishop explained that the diocese’s review board consists of an abuse victim, a priest, a retired judge, two attorneys, a lay expert on Church law, a counselor and a social worker. That board has hired a professional investigator to evaluate the evidence and determine the validity of the allegation. 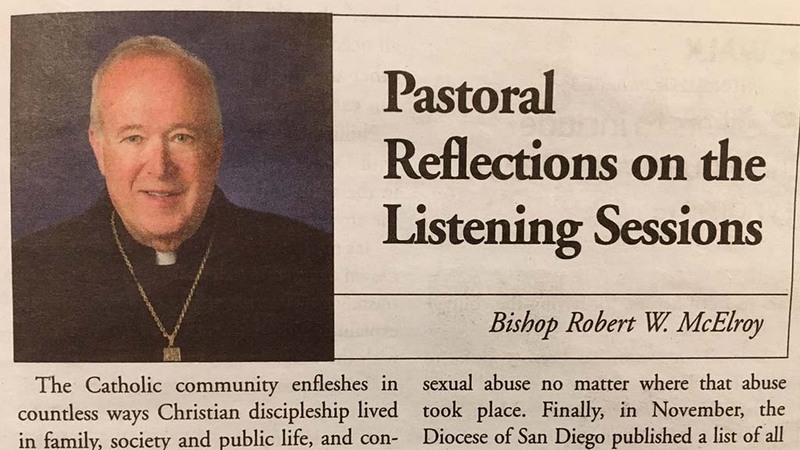 A finding of abuse against a minor calls for automatic and permanent removal from public ministry, the bishop writes. Parishioners also requested action involving adult victims. In response to that request, the review board will now review all allegations of sexual misconduct by priests against adults “where there is any indication of harassment, coercion, spiritual manipulation or disparities of power and position,” he writes. In addition, he said, the diocese has hired a firm to extensively examine diocesan files for past sexual abuse of minors or danger signs of substantive risk of inappropriate clergy behavior. The review will be completed in February. In November, the diocese released a list of priests who served in local church assignments who had a credible accusation of sexual abuse of a minor. McElroy wrote that he believes that despite the parishioners’ anger and disillusionment, a deep faith and love for the Church continues.